Just like our driveways, our interlocking patios and walkways are also produced to our exceptionally high standards. This is very important as patios are often the first thing that a visitor to your home will see as they approach your front door. A custom designed interlocking patio will leave the most discerning visitor with a great first impression. The Action Home Services team is able to design and build a wide variety of interlocking patios designs, tailored to your exact needs. We will also be able to offer some informed suggestions about what colours and design types will best compliment your home’s design. It is becoming more and more common to see homes with interlocking patios. As homeowners realize exactly how beautiful their home can be, they often jump at the chance. If you are tired of looking at your dull grey patio, then it may be time to look into other options. An interlocking patio design can be just what you need to make your home into something truly spectacular. In any of our interlocking patio projects, we work hard to make sure that we deliver exactly what it is that you have in mind for your home. After all, we want you to feel very happy with the end result. With this in mind, we make sure that we don’t take any shortcuts and only use the best possible materials available. The specialized team at Action Home Services is able to design & install custom patios. You can benefit from the many years of experience that we have in creating the perfect backyard to suit any customer’s needs. If you are looking to give your backyard a brand new look, the first step is to get in touch with us. You will be able to choose from a variety of styles and materials and we can get to work right away. All you need to do is to plan when you’re next having guests over so that you can show off your brand new backyard patio. 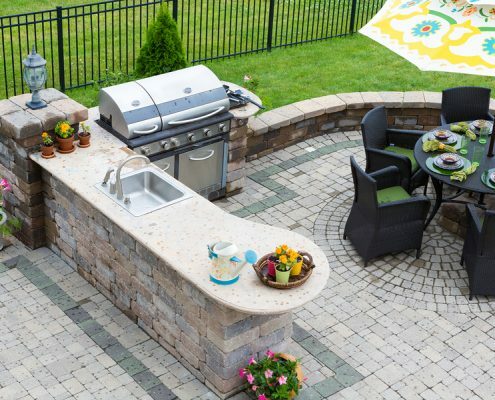 The design of your backyard patio is entirely up to you, you will be able to have the design be anything from a basic interlocking patio, to an exquisitely designed, and custom built outdoor kitchen. The Action Home Services team is proud of their ability to always leave their customers thrilled with the end result of the work they do. Whatever you have in mind for the design of your backyard patio our expertly trained professionals will not rest until you have your dream backyard completed in no time. When you step into a family or friend’s backyard for the first time, think about all of the things that you notice straight away. Is the patio cracked, infested with weeds, or suffering from a general lack of maintenance. Now, take a look at your backyard patio and try to imagine you’re seeing it for the first time. You may be surprised at what you notice. 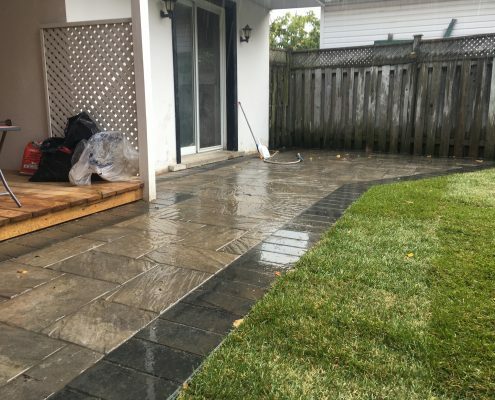 The Action Home Services team is dedicated to making sure that the interlocking patio that you have installed in your backyard looks great from the moment we leave your property and for many years to come. Your backyard patio will make an impression on your guests when you’re entertaining. It is essential that you choose a backyard interlocking contractor who is up to the job and have the experience needed to do the job right the first time. Any backyard can be transformed into a magical event space with the inclusion of a firepit. Our design team will work closely with you so that we fully understand what you want your fire pit to look like. If this is something that you are interested in, you should know that you are not alone, not by a long shot. 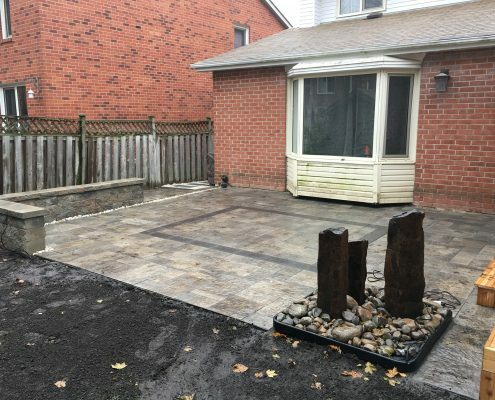 Many homeowners in the Toronto and surrounding area have discovered the joy that can be had by sitting around a fire pit in their own backyard. A firepit has a certain magic that is lacking from an outdoor fireplace, as there really is something deeply satisfying about a real fire burning as you sit around with loved ones during an evening. Having a fire pit installed professionally by the Action Home Services team will add value to your home. So the investment you put into the fire pit’s construction will pay off monetarily if you decide to sell and you will certainly get many more times the value of it in sheer enjoyment. 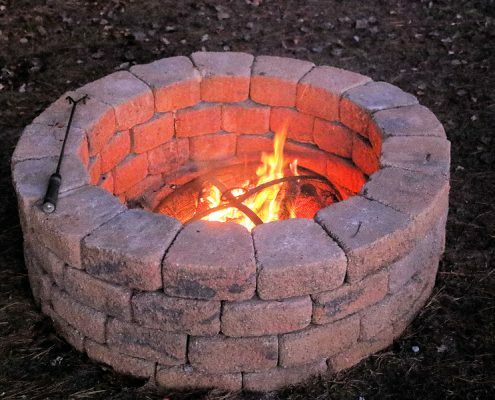 If you are interested in having your very own fire pit, then getting in touch with the Action Home Services team is the best place to start. You will be connected with the design team and they will start working on your project as soon as possible. In no time at all, you will be able to have friends and family gathered around your fire. Do you love entertaining in your backyard and want to take the experience to the next level? If so, an outdoor kitchen is the way to go. Not only will you be able to cook and serve gourmet food to your guests and family, you’ll be able to do it in style. Making an investment in your backyard is a big decision and you should only trust a team of experts that are able to get the job done right from the start! Action Home services are able to provide you with an expertly designed outdoor kitchen that is built using the best quality materials available. There really is nothing quite like having an outdoor kitchen when it has been custom built for your needs. Not only will your brand new outdoor kitchen look great and function perfectly, it will also add a significant amount of value to your home. This makes the investment really worthwhile as it will more than pay for itself.